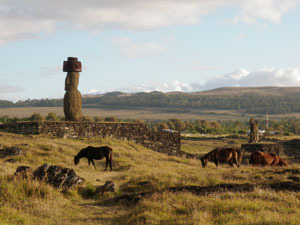 Steph's Endurance: Easter Island - Landed! Well, that was a really really long trip from Malaysia to Easter Island. It would have been shorter to go east across the Soutn China Sea, to the Pacific, but I had to go back west to pick up the LAN flight from Santiago. Around 40 hours total air time... plus connections. Three days of travel. I had decent flights, aisle or exit row seats, the worst part was the TWO HOURS it took me to get in and out of LAX airport. long long lines at passport, customs, security. pretty nasty. But the flights were fine - I watched a lot of movies (Robert Duvall is great in Get Low), read a good book - House Rules (family with autistic boy trapped in murder/legal intrigue). And today Sunday November 14 (I had to ask!) I landed on Easter Island, Isle de Pascua, Rapa Nui, El Ombligo del Mundo (the bellybutton of the world), the western most island of Polynesia. OMG I haven't been this excited on landing in a new place in a long time. This little island, population around 4000 I think, is the most geographically isolated, remotest place in the world. I watched a nice video on the plane, giving a taste of the history, culture, etc. The native population went from several thousand at its peak to only 111 individuals. I'm here thanks to EnduranceX (www.endurancex.com) - Luis Enrique Opazo's brilliant 'extreme endurance riding' aventure business. Last year he brought me to the race at Torres del Paine National Park in Patagonia. My mission is to tell the world about his endurance rides in exotic places. I can do this!! 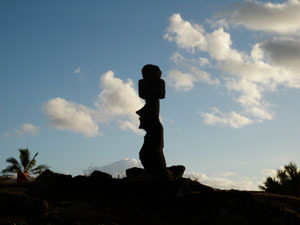 So in typical Steph style, I put off thinking about the Easter Island trip until I got to Easter Island. I was busy with the Owyhee rides, then took off to Malaysia, and I figured I'd just figure everything out once I landed. I just assumed Luis (Guyo) was keeping track of my arrival and would have somebody at the airport to meet me, but I was a few days early... so wasn't sure. Oops. Steve and Dinah Rojek were on the flight with me - I had mentioned this ride to them and Steve's exact words were 'sure! what a hoot!'. So we'll be on the island together, its really nice to have friends here. 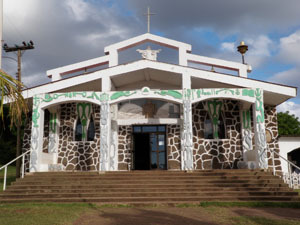 o here I am at the Hotel Uka http://www.hoteluka.com/ingles.html - a little family style hotel about a ten minute walk from the ocean, right next to an old stone church. I have WiF! and a glass of wine (a bottle of red Chilean wine that I bought at a little market for 5000 pesos (that's about $10). and it's quite good. It's 10pm, I had a wonderful walk along the coast saw lots of Moia along a very beautiful coastline, waves crashing against the rocks, lush tropical vegetation, a long grassy park with paths along the statues, horses grazing in their shadows). 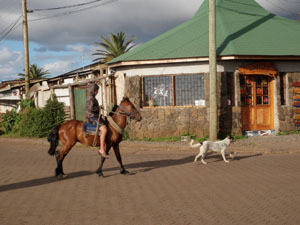 There were some tourists wandering around, plenty of locals on surfboards and riding their horses along the street. Dozens of fun little shops were luring me in!! Ican't wait to check out the local artisans. Dinner was some very good pizza at a little cafe, and am now sitting here on a little round plastic table and chair outside my room, it's getting pretty cool, there are a couple of cats to keep me company. All's well! (as I'm writing this I hear somebody riding down the dark street, clop clop, on horseback - there are horses everywhere). Beautiful pictures of one the most beautiful chilean destinations. 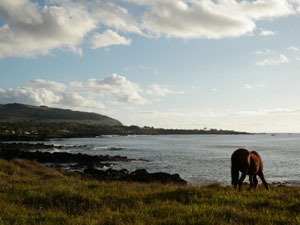 Don´t forget to explore the archaeological areas while you enjoy your Easter island vacation Regards! Looking forward to more news of your trip. It looks amazing!